Amid record temperatures in July and August, fires burned across the West — 50 individual large fires were blazing on July 25 alone, wreaking havoc on air quality and on firefighting resources. Wildfires burned throughout California and much of the West in July and August, amid record heat. Photograph is courtesy of CDF VIP Wes Schultz. On July 25, in California, 12 major fires were burning, with close to 47,000 acres up in flames. The largest individual fire was in San Bernardino National Forest in Southern California, burning more than 24,000 acres, with the fire only 62 percent contained. The largest fire in the state this year, however, burned nearby in the San Bernardino Mountains in mid-July, taking out 61,700 acres, 50 homes, and killing one person, according to the California Department of Forestry and Fire Protection. Lightning strikes started many of the fires, with hot, dry conditions only making things worse. As of late July, more than 810 large fires had burned across the United States, with close to 68,800 wildfires in total, according to the National Fire Information Center (NFIC). 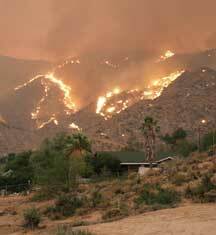 By contrast, the same period in 2005 had seen just over 36,400 wildfires. At the end of July, 2006 had marked the worst wildfire season in the past six years, largely due to a couple of large fires in Texas and Oklahoma early in the year, according to NFIC. At an average elevation of more than 5 kilometers, the Tibetan Plateau is the highest and largest plateau in the world and covers an area of 2.5 million square kilometers — roughly four times the size of Texas. Scientists have long known that the plateau, projecting high into the atmosphere, has a profound effect on weather in the region, absorbing and transferring massive amounts of solar energy back to the atmosphere, thus activating large-scale convection that helps drive Asian monsoons. Now, researchers are finding that the plateau’s unique topography may also influence the distribution and transfer of ozone, carbon monoxide and water vapor between parts of the lower atmosphere — particularly when the mountain weather is stormy. The plateau, which is flanked by the Himalaya and is sometimes called the roof of the world, formed after the Indian subcontinent began plowing into Asia at full speed about 40 million to 50 million years ago. Uplift of the Tibetan Plateau after the collision of the two plates, which continues today, may have begun as early as 35 million years ago (see Geotimes, April 2006). Storm fronts along the plateau churn up the atmosphere and can cause the tropopause — the variable boundary between the troposphere (the layer of atmosphere extending from Earth’s surface to about 12 kilometers high) and the next highest layer, the stratosphere — to lower, perhaps to nine or 10 kilometers, says G.W. Kent Moore, a physicist at the University of Toronto. The stratosphere, between 16 and 48 kilometers above Earth’s surface, contains most of the ozone in Earth’s atmosphere. This layer is often thought of as “good” ozone, because it protects Earth from harmful ultraviolet rays. However, breathing ozone is highly toxic and can damage the lungs, causing coughing, bronchitis and even pulmonary edemas, making ozone from pollution near Earth’s surface “bad” ozone, Moore says. People generally have little opportunity to come into contact with the layer of ozone in the stratosphere, but Mount Everest, at nearly 9 kilometers high, is close to that boundary layer, says John Semple, a mountaineer and professor of surgery and surgeon in chief at Women’s College Hospital at the University of Toronto. Initially, Semple and Moore were interested in investigating the impact that a fierce storm with a very low barometric pressure might have on mountaintops and thus on climbers’ health. “Barometric pressure dictates how much oxygen is available, particularly at extreme altitudes,” Semple says. But while studying the effects of a strong 1998 storm on the weather on Mount Everest, the researchers observed in satellite data a “filament” of ozone that extended down from the stratosphere, close to the mountain. That data suggested that conditions existed that might either draw down ozone from the stratosphere, or pull it up from the troposphere, the authors say. To get a clearer picture of how much ozone was in the air around the Himalaya, and where it might be coming from, Moore and Semple measured ozone concentrations from the Himalaya in Bhutan and compared them with a composite of satellite ozone data from 1997 to 2004. The researchers found that ozone concentrations in the Bhutan Himalaya in 2004 showed a strong gradient, increasing with altitude from 3,000 to 5,000 meters. That pattern is opposite of what would be expected if the source were a pollutant from the ground, the authors say. They hypothesized that a powerful storm churning up the atmosphere could lower the tropopause, bringing ozone-rich air to a lower altitude. The distribution of elevated ozone concentrations, however, was also unusual. The satellite data showed that during that time, ozone concentrations were low only over the Tibetan Plateau, but higher around the edges, including over the Himalaya, forming a kind of halo around the plateau. That halo is the effect of a “Taylor cap,” Moore says — a type of geophysical phenomenon more generally used to describe the effect a submerged seamount has on seawater flow. A Taylor cap occurs when a tall obstacle sits in the way of a fluid: It deflects the flow around it, while the fluid directly above the obstacle remains stationary. Likewise, Semple says, the Tibetan Plateau “actually displaces the ozone onto the Himalaya,” after the storms have drawn it down from the stratosphere. Although still low relative to harmful ozone concentrations at sea level, the resulting elevated ozone concentrations found in the Himalaya can be more harmful at extreme altitudes. Climbers often suffer from coughing and bronchitis that they attribute to the effect of the cold, dry air at extreme altitudes, Semple says. The elevated concentrations of ozone, however, may contribute to pulmonary illnesses suffered by climbers in the region, the team reported in the November 2005 Geophysical Research Letters. Although the ozone’s source is not human pollution, the interaction of fierce storms with Tibet’s high topography may actually be creating a pathway for other pollutants from Earth’s surface to reach the stratosphere. Large amounts of water vapor and carbon monoxide have been observed in the upper troposphere over the Indian subcontinent during the monsoon season, but somehow, the highest concentrations in the upper stratosphere are found to the north, over the Tibetan Plateau, says Rong Fu, a climatologist at the Georgia Institute of Technology in Atlanta. To better understand how these chemicals are traveling up from the troposphere and into the stratosphere, Fu and her team studied temperature, water vapor, carbon monoxide and other chemical measurements during the monsoon seasons of August 2004 and August 2005. They found that, although there were more thunderstorms over the Indian subcontinent, the storms over Tibet transported three times as much water vapor into the stratosphere, partially because convection over Tibet is deeper and pulls more water vapor and other chemicals higher into the atmosphere, the researchers reported in the April 11 Proceedings of the National Academy of Sciences. As a result, the Tibetan Plateau acts as a main conduit during these storms to shoot both water vapor and carbon monoxide into the stratosphere, Fu’s team says. Understanding how these chemicals reach the stratosphere can both improve climate prediction models and help scientists track the path of potentially ozone-depleting chemicals, Fu says.